The one thing that connects all these fads is just that - they were fads. Yes, some of them have become embedded in practice in some niches, but the idea that they were going to transform education more widely has now been forgotten - and now it's on to the next great thing, and it seems the next great thing for the foreseeable future is ... AI. If you believe the hype we're now at a point where computer software can be designed to be clever enough to analyse how well a student grasps a topic, learn from their answers so that it can set more challenging problems, and hence grow their understanding independently of teachers. Effectively, and according to those selling the software at least, the new AI can take what is potentially the most challenging thing a teacher has to do - understand whereabouts a student is within Vygotsky's Zone of Proximal Development - and scaffold their learning appropriately. "[the Zone of Proximal Development is] the distance between the actual developmental level as determined by independent problem solving and the level of potential development as determined through problem-solving under adult guidance, or in collaboration with more capable peers"
So what's this got to do with two different approaches to Edtech? I believe it's about what I tend to refer to as 'embedded cognition', i.e. the ability of an artefact to embed within it some level of human thinking. But let's backtrack a bit, and look at some examples of this idea from other contexts. Now I'm not going to start going on about Luddites, after all, there's an awful lot of misconceptions over who they were and why they did what they did, but what I think is not misconstrued is how machines began to take on some basic human tasks during the industrial revolution, and by doing so increased the pressure on an already challenged workforce. 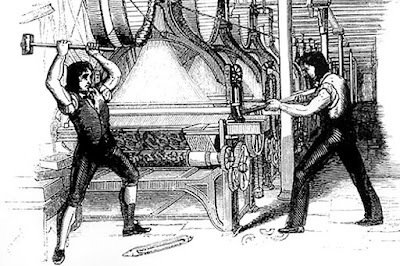 What happened, in effect, is that small, repetitive, and basic tasks could be adequately simulated by mechanical machines. The level of cognition required to carry out these tasks was successfully embedded into a combination of rotors, cogs, motors, etc. such that the human was no longer required. Now, let's compare that to the AI example in education, above. Is this equivalent? Are the mental processes that a teacher goes through when trying to understand how well a student understands a specific topic, some form of small, repetitive, and basic task that can be adequately replicated by a machine ... even if it is a computer? Is it really completely replicable between individual students, i.e. are individual students merely part of the manufacturing process, something for which education simply needs to be done too? Of course not. This is the industrial model of education, and of Edtech, which has been given a new spin by the wonders of AI. What is, of course, missing from this model is captured in the quote from Vygotsky, above. It's the guidance that is crucial, whether it is coming from an adult or in collaboration with more capable peers. It's that very tricky thing to do, to actually listen to someone else's understanding of a topic, and offer different perspectives and ideas based on your interpretation of that understanding. It's not simply marking an assessment and then delivering new problems to solve - that is not guidance. The AI sellers will tell you that their programs intelligently analyse individual students progress over time and that they can understand patterns and deeper understanding, but that's hard enough for an experienced teacher to do let alone a computer. Those companies who have been doing this for a while, or at least trying to do this for a while, are now beginning to admit that they totally underestimated the scale of the challenge and the incredible complexity that is involved in any one individual's understanding. Some at least are backing off from the strongest claims, though here in the UK we still seem to be at peak hype. So that's one approach to Edtech - teacher replacement via AI (they're still calling it workload reduction for now). I argue it's based on a flawed understanding of teaching and learning that will inevitably fail. So what's the other approach? If Vygotsky is right about the ZPD, and let's face it many people think he knew a thing or two about this, then the key to teaching and learning is working in a specific zone whilst being guided by more capable others. So teachers and students, basically, not Edtech. That breaks down into a number of specific tasks that teachers need to carry out to make that work - preparing content that can be experienced, creating blends of individuals with some more capable than others according to topic, ensuring the strongest and weakest are adequately supported, working out how well individual students have grasped a concept, those sort of things. Everyday teaching, if you like - investigating new content, collaborating with each other, differentiating between individuals, assessing pupils progress, etc. That sort of complexity is very, very hard to simply replace with Edtech, the computer programs would have to know so much about the context of the work taking place, the topics being investigated, the individual personalities of each and every student, the list goes on. 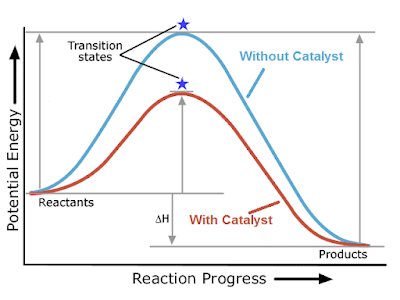 However, what computer programs can do is help to catalyse each and every process. "A substance that increases the rate of a chemical reaction without itself undergoing any permanent chemical change." Learning is about being exposed to different perspectives and creating personal connections between them which build on prior understanding. If you like it's a reaction between a learner and their context, and especially the teacher or other more capable peers. What Edtech can do in that context is accelerate some of the tasks that teachers and students carry out as part of that reaction. It's not going to replace a task like in the AI model above, but instead make it easier to accomplish an existing task. Let's take investigating new content, for example, and see how this task might be catalysed in practice. By using services like Google Alerts content can be fed to learners automatically, speeding up the finding of relevant information. Similarly, services like Scoop.it can speed up and simplify the process of organising and curating that information. Collaborating face-to-face is undoubtedly the best way of working together, but not always feasible. Edtech apps like Padlet can extend that collaboration, not only across time but also by allowing more individuals to participate, and hence accelerate what can be learnt from others. Assessment Edtech apps like Socrative and Quizlet can automatically collate, grade and store student responses over time, speeding up the assessment process and allowing the teacher to focus instead on interpreting results. In these examples the embedded cognition in each app is designed to align with a specific teaching and learning need, helping to accelerate and simplify the task in each case. So what's it to be: Replacement or Acceleration? So there's my take on AI; I suspect a few too many smoke and mirrors at the moment, promises without much evidence to back them up. As a tech nerd myself, I love the idea that AI can enhance teaching and learning, but there's just not enough evidence to back it up. Just how humans learn, how we turn from wailing babies into the most incredible and complex individuals we all are, is almost certainly THE most difficult thing we have to understand as a species, and something we're still a long way from solving. Yes, we have lots of bits and pieces of the puzzle, but human psychology and development is still a young science with a long way to go. To postulate now that we can simply roll computers into the learning gap and things will be better is naive at best, arrogant at worst. Getting faster, higher-quality teaching practices is, oddly enough, not straightforward (what's that line about free lunches again) - but did I mention I've already developed something to help, and it's free? 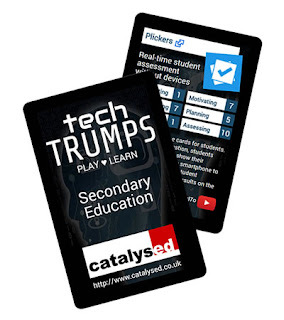 If this article has peaked your interest, then take a look at my Tech Trumps®, digital playing cards in the top trump style designed to help you find the right Edtech to suit your needs. It's a curated list of the best digital technologies available, mapped against the kind of tasks you as a teacher face every day - investigating, collaborating, assessing, etc. I hope you find them useful, and that you'll find something in there to catalyse your own practice.